There was a great shot by Tombari, early on in the match, for Aspire Academy; and Dhouibi had some strong headers in the game for Espérance. It had been a fairly even opening for both teams, 13 minutes into the game. All the seats were full – there was a tremendous crowd out there tonight. The Tunisian team looked like they needed to have more composure on the ball. Espérance got a penalty kick, after a mistake by Aiash. The penalty was well executed, by Berrima, and Espérance got their opening goal. Aspire Academy was looking very anxious to get that equalizing ball in, right from the beginning of the second half. Espérance looked like they had changed tactics in this half; they were showing great character to keep their goal intact. It was 20 minutes to go, and Espérance was still leading with that opening goal. Al-Naimi came off the game in the last few minutes, and I thought it was strange to take a good defender off, when you were losing. Espérance managed to hang on, until the full time whistle was heard. It was a fantastic atmosphere around the pitch tonight; there was a good support from the Tunisian fans. It was a great save by Jebali for Espérance in the first few minutes; it was the best chance of the game for Aspire Academy. 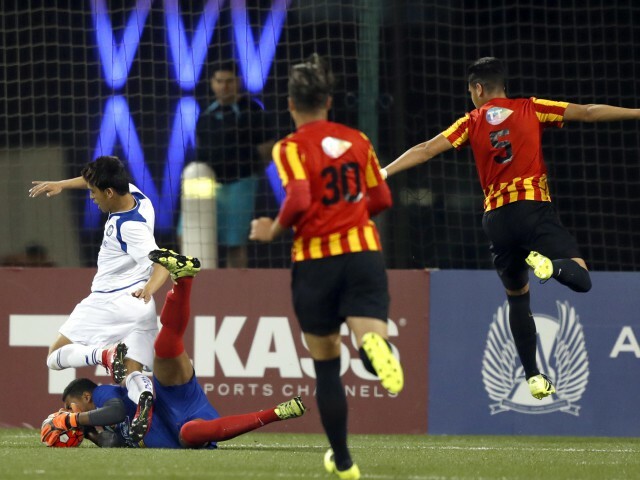 Aspire Academy displayed some vital tackling skills on the field – the locals were playing really well tonight. There was a wasted free kick from Aspire Academy 28 minutes into the clock. A penalty kick, taken by Berrima, made it 1-nil for Espérance and it stayed that way, when the halftime whistle was heard. It was a very close and competitive game in the second half. Aspire Academy just had to push forward and keep in there more to get their opening goal. It was hard to guess which way the game was going to go, because Aspire Academy had that passion and determination to get that equalizing goal. Tombari had a few good chances in this game, but he really couldn’t hit the target with either of them.